Improve quality and build real confidence in your products with codeBeamer ALM’s comprehensive software Quality Assurance and Test Management features. Ensure traceability, transparency, and enforce the use of mature software Quality Assurance processes throughout the lifecycle. Through its software QA and testing capabilities that are fully integrated into its ALM feature set, codeBeamer ALM helps you implement mature Quality Assurance processes throughout software development. Lifecycle-wide documentation and reporting features help you prove process maturity to build confidence in your product. Advanced test analytics enable you to discover bottlenecks and maintain continuous improvement. 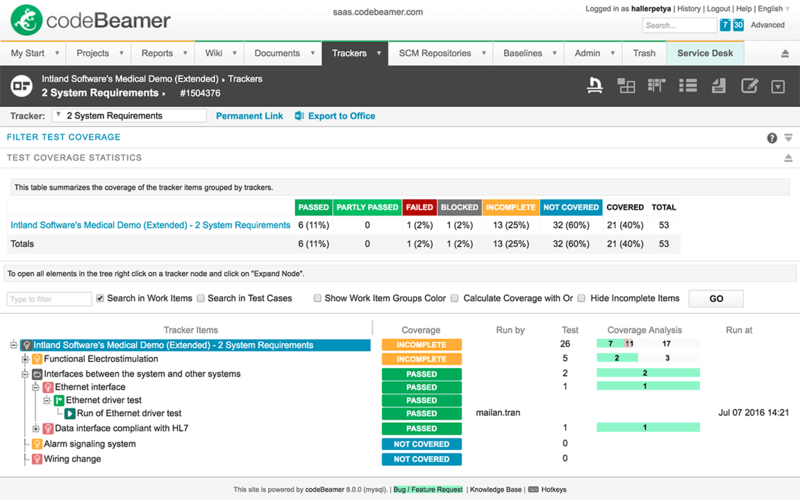 codeBeamer’s single repository architecture ensures gapless end-to-end traceability, supporting requirements-based testing and the comprehensive analysis of test coverage. 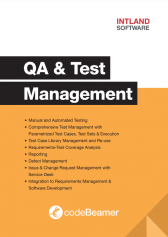 Its advanced software Quality Assurance features let you define test cases, plan and organize them into test sets, and save these in test libraries for later re-use or execution on multiple test configurations. Parameterized test cases may be simply defined, and executed manually or automatically via Jenkins. Out-of-the-box integrations are offered with other testing applications, and a flexible REST API lets you create custom integrations. Test management in codeBeamer is integrated with bug management, and in case of a failure at test execution, bugs may be reported automatically. Through its scaled Agile support (via SAFe®, the Scaled Agile Framework), it helps the development and QA of complex system-of-systems products. Its comprehensive DevOps functionality supports the alignment of Development and Operations teams to enhance efficiency, product quality, and user satisfaction. 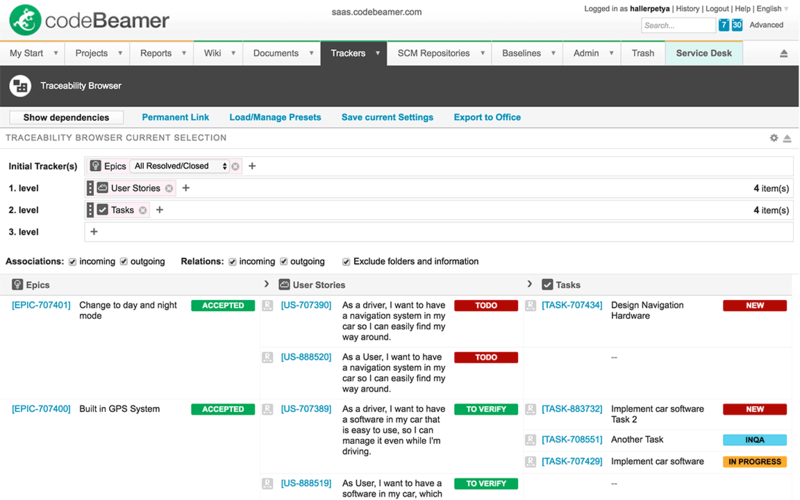 codeBeamer’s integrated Service Desk (with SLA & escalation management) connects users with your internal development processes, ensuring that no issue is left unattended. The real-time monitoring of all issues, test coverage information, analytics, and automated documentation & reporting features help cut compliance audit time and costs. Achieve complete traceability with codeBeamer’s QA & testing feature set, which is fully integrated with demands, requirements, and development within our ALM tool. This provides consistency and gapless end-to-end traceability throughout the entire lifecycle. To support requirements-based testing, the Test Coverage Browser provides an overview and statistics on both the test coverage of requirements, and test execution results of all test cases. Define test cases manually in a collaborative manner, derive them from requirements, or import them using MS Office (MS Word or Excel). Define or import test parameters and set product failure profiles to save a great deal of time and effort when testing multiple product variants. Save test cases in libraries retaining hierarchies and dependencies for later reuse across all projects (facilitating the management of product variants). Group parameterized test cases into test sets based on type, importance, product feature, etc. Use test configurations to define both the tested product and the testing environment. Initiate, execute, and monitor test runs with real-time reports and testing dashboards. Analyze coverage, and create automatic reports on test results to ensure that no critical aspect goes untested. The (separately purchased) Review Hub is a powerful add-on for approvals management that helps you better satisfy customer needs with high quality products. It allows you to set up review processes, to assign a list of items (such as requirements, test cases, documentation, etc) to chosen reviewers, and to carefully track the process of reviewing using real-time data. With the Review Hub, you can easily trace changes to specifications, and review all the actions resulting from these changes. The Review Hub lets you export review statistics to simplify reporting. Align development and operations teams, and support Agile testing and bug fixing sprints. Build higher quality software using codeBeamer’s continuous and parameterized testing features. Automation is supported via codeBeamer’s Jenkins integration as well as an open REST API, allowing you to integrate and automate testing processes. Manage SLAs and benefit from real-time feedback directly from your customers: configure a user-friendly Service Desk dashboard to allow them to submit bugs, change requests and other issues. Use our Service Desk as a centralized system or as a virtual service desk for distributed working environments. Use it with Computer Telephony Integration (CTI) to enable interactions between telephone systems and codeBeamer’s web client, providing a single point of contact between users and IT Service Management. Issues and escalations may be simply managed using advanced workflows and flexibly configurable Kanban boards. For DevOps teams, integrations are offered with container tools Docker and Kubernetes. Create test sets and execute test runs manually or automatically for certain features and components to support the efficiency of development. Run unit tests via codeBeamer’s Jenkins integration. Create baselines to record and automatically version all test-related information in the background, along with all artifacts, documents and communication at the time of versioning. Record the state of projects at strategic points in development for refactoring and auditing purposes. Browse previous baselines to uncover deviations. codeBeamer ALM automatically records all your lifecycle data in its central repository. Advanced analytics features and flexibly customizable reporting options help you monitor your processes via shareable and exportable dashboards with data visualization. The Audit Trail Dashboard lets you simply access any and all data neatly organized to support compliance audits. With the Audit Trail Dashboard, you can easily overview all changes to your trackers, fields, workflows and transition diagrams, and current permissions. All this information is accessible with a few clicks, and may be added to a continuously updated widget, or exported to accelerate audits and to cut product verification time and costs. To ensure the consistency of testing data and the seamless integration of QA processes, codeBeamer offers integrations with a variety of software tools and a flexible REST API for custom integrations. Out-of-the-box integrations include JIRA, Jenkins, JUnit, Selenium, TeamCity, VectorCAST, Cantata, HP-QC and more. The MS Word and Excel round-trip functionality helps collaborate with internal and external stakeholders. Connect teams, processes, and 50+ tools seamlessly via the Tasktop Integration Hub. Before using codeBeamer, we had to spend at least one or two hours with customers for a conference call each week. …After applying codeBeamer, the conference call is no longer necessary because everything can be communicated clearly through codeBeamer, and this has saved us lots of time. ISO 29119 Testing Standard – Why the controversy? Why QA + Testing is so Important?